Do you remember the day you took the Scholastic Aptitude Test (SAT)? It was probably a Saturday in the spring, likely at a high school, not necessarily the one you attended as a student, in a room full of nervous eleventh or twelfth graders. All of you in that room knew that the test you were about to take would be critical in determining where you went to college. Remember how anxious you felt that day? Imagine that the SAT also determined how much you would earn after college. The SAT is comprised of three major sections: mathematics, critical reading, and writing. The test was originally designed to predict performance in college. The developers of the test envisioned the SAT is administered to students who had no prior preparation in the content or format of the test. The College Board continues to claim that performance on the SAT cannot be improved through test preparation. The test is administered to over 1.5 million students per year, with the number who sit for the exam rising each year. The writing section of the test is a recent addition to the SAT. It was introduced in 2005. With a decade of the writing portion of the SAT having been administered, is it possible that this portion of the test is useful in predicting job performance after graduating? According to a press release from Grammarly.com, a website that helps people improve their writing skills, the writing section of the SAT predicts first-year college performance, rates of graduation and post-graduation salary. There are good reasons that you might expect this. First, the freshman year of college typically includes more coursework with writing requirements. Second, college professors, in general, place a heavy emphasis on a written expression so good writing skills increase the odds of completing an undergraduate degree. And finally, many professional positions require writing, so once again the value of being able to express yourself this way is important. Therefore, writing well is associated with earning and career success, but does this mean that the writing section of the SAT should be used in hiring decisions? When research indicates that one thing predicts another, overlooked in these presentations is how strongly it predicts it. While Grammerly.com's press release reported correlations between each section of the SAT and college freshman grades, graduation rates, and post-graduation salary, there is a large difference in how well one's writing section score predicts each outcome. On the one hand, the SAT predicts college graduation very well. On the other hand, the SAT predicts post-graduation salary very poorly. In other words, the SAT is a good indicator of whether you will graduate from college, but not a good way to predict how financially successful you will be after you earn your degree. Writing is a skill that can improve over time, long after completing the SAT. In fact, much of the early coursework in college stresses writing for the express purpose of improving this skill. As students gain more experience in courses that emphasize writing, the relevance of the SAT decreases. Therefore, your performance on the writing portion of the SAT does not mean you cannot further improve your skills. Imagine having so much riding on a single test. It’s stressful enough knowing the SAT is used for college admissions decisions, and that it is a predictor of whether someone completes a college degree. Anyone who has taken the SAT knows that many things can happen that could affect their score. 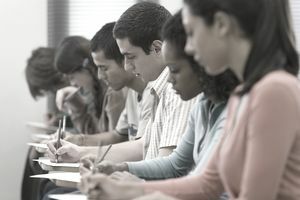 Factors that might influence test performance include a testing room that is too hot or too cold, excessive noise at the test site, personal life stressors unrelated to the exam or being ill on the day of the test. It is not uncommon for people to feel sick when under stress. If students taking the SAT were also anticipating how their performance would affect their future earning ability, there would likely be an increase in stress-related illnesses among those taking the test. The SAT is clearly an important test, but it is necessary to recognize its usefulness and its limitations. It is clear that the SAT will predict whether you will earn your degree, and will predict how you will perform in your first year of college, but it is a poor indicator of post-graduation salary.